This weekend I decided to make summer cupcakes with Ava. I am a great everyday cook, but not as experienced with pastry cooking. I have made every kind of meal under the moon in my prized Le Creuset dutch oven, but when it comes to cupcakes the most adventurous I have ever gotten was making a prepackaged muffin mix! I thought making cupcakes would be a great way to spend the afternoon with my daughter and introduce her to cooking. As a lover of cookware, I splurged on the necessary baking utensils. I also bought some cute flower paper cups, edible butterflies, and flower packaging boxes. What did I learn? One, cupcakes are MESSY (especially with a toddler) and two not so hard to make when keeping it simple! Heat oven to 350 degrees F. Line 12 standard muffin cups with paper baking cups (I chose fancy flower cups). Sift flour, baking soda, baking powder, and salt into a medium bowl. Combine sour cream, milk vanilla in small bowl until well blended. Beat granulated sugar and butter in large bowl with an electric mixer at medium speed 2 minutes or until fluffy. Add eggs, one at a time, beating well after each addition. Add flour mixture alternately with sour cream mixture, beginning and ending with flour mixture, beating well after each addition. Bake 21 to 23 minutes or until toothpick inserted into centers comes out clean. Let stand before moving to next step. Okay, so that was the really easy part! The whole point of this cupcake adventure was to do something fun and entertaining with my daughter and anyone that has a toddler knows their attention span runs short! So, I wanted this next process to be simple and fast. I decided to not make the icing, but instead buy 2 containers of readymade white frosting. I added food coloring to the icing to create a color I liked. To get a real cupcake look you will need to squeeze the the frosting out from an icing bag with an attached nozzle. I used one of the smallest nozzles that came with the set I bought. The first couple of tries I totally messed up, but I soon picked up the technique. I think if I make cupcakes again I will do much better with squeezing. 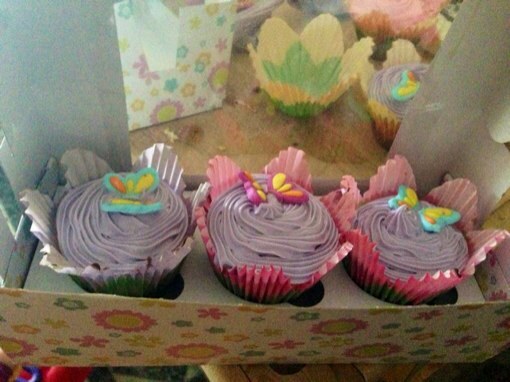 To make the cupcakes a little more fun I topped them with edible butterflies. They tasted pretty good and my daughter really liked the actual muffin. The icing part is still too sweet for though. Do you ever make cupcakes with you children? Do you have any favorite recipes?